If your idea of a heavenly vacation is amazing sunset views over a glistening Caribbean Sea, then CéBlue Villas in Anguilla is for you. Whether you visit with one other couple or four, the design of the suites allow for easy transition between privacy and togetherness within your group. The resort encompasses eight private villas, all with dramatic ocean front vistas, plus the clubhouse. A villa resort by design, CéBlue Villas offers the privacy of your own villa with resort amenities close-by. 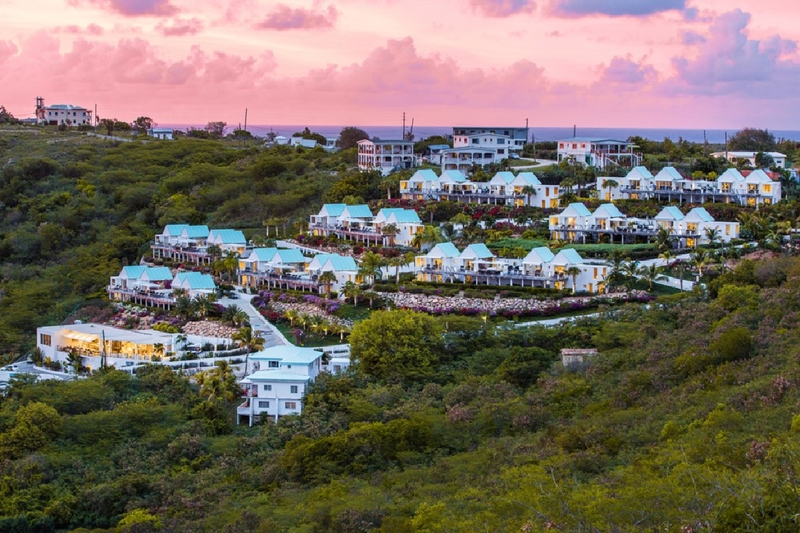 Crocus Bay Beach, dining options, and outdoor activities complete the experience. CéBlue Villas is built into the Crocus Bay hillside overlooking the shimmering sea. Spectacular architecture, tropical scenery, tasteful furnishings, and a deluxe kitchen offer unequaled comfort in paradise. These villas sprawl across Crocus Bay, and are minutes from the beach. Two decks, covered and uncovered, stretch across the hillside for morning sunbathing or evening entertainment. The sunset reflects off the sea at dusk, and hidden lighting illuminates the garden at night. CéBlue is within walking distance of Crocus Bay and Anguilla’s historic Upper Valley and Heritage Trail. Crocus Bay is an ocean-lover’s dream, with scuba diving, fishing, windsurfing and paddle boarding at visitors’ fingertips. Beach attendants will set up umbrellas and loungers for guests onshore. Offshore, golfers can play on Greg Norman’s championship course and spa-lovers can get salt scrubs and seaweed wraps at The Blue Spa at CéBlue. The resort also has fitness facilities with top-of-the-line equipment and personal trainers. The property features daily housekeeping, reverse-osmosis water filtration, WiFi, and full air-conditioning. All the comforts of home are here, including luxury linens and towels, a washer and dryer, and a fully-equipped media room and kitchen. The media room has an Xbox or Playstation upon request, several board games, and a sound system. The kitchen has stainless steel appliances, a gas stove, a wine cooler, and cookware. Ten guests can eat in the formal dining room, which opens on two sides to the terrace. There’s also a resort game room with table games and more. CéBlue has five king suites, each with individually controlled air-conditioning and a private bathroom. Each suite opens to a private terrace with ocean views, and the bathrooms overlook the sea and gardens. One suite also has an adjoining children’s suite with a twin bunk. CéBlue Club has plenty for guests to explore, including complimentary warm breakfast each morning, afternoon cocktails, and full service. It’s also near Da Vida and Bayside Grill, which offer five-star cuisine and casual, beachfront meals. Rates do not include: tax of 12%, damage waiver fee of $70.00, island charges of 10%. Bedroom 4: Main Level Family Suite - This room is larger with an adjoining alcove for children. Crocus Beach is below the resort. $3 per person/per night government marketing levy fee. Car rental, private chef, butler, server, grocery and beverage shopping (pre-arrival and during your stay), liquor and wine delivery, nanny service, baby equipment, spa services, yoga and personal training, photography, and private airport transfer/car service can be arranged for an additional fee.